In this Dutch name, the family name is Van Halen, not Halen. Alexander Arthur Van Halen (born May 8, 1953) is a Dutch American musician who is the drummer and co-founder of the hard rock band Van Halen. The band was formed in 1974 by Alex Van Halen; his younger brother, Eddie Van Halen; David Lee Roth; and Michael Anthony. Warner Brothers signed the band in 1977, and its debut album was released in 1978. Alex and Eddie Van Halen are the only members of Van Halen who have been in the band throughout its existence. Alexander Arthur van Halen was born in Amsterdam. His Dutch father, Jan van Halen (1920–1986), was an accomplished jazz saxophonist and clarinet player. His mother, Eugenia van Beers (1914–2005), was an Indo (Eurasian) from Rangkasbitung, Indonesia. Alex spent his early years in Nijmegen in the east of the Netherlands. The family moved to Pasadena, California in 1962. Both Alex and his younger brother, Eddie, are naturalized U.S. citizens. Both Alex and Eddie Van Halen were trained as classical pianists in their childhood. Although Alex is known as a professional drummer, he began his musical aspirations as a guitarist, with his brother Eddie taking up drums. While Eddie was delivering newspapers to pay for his drum kit, Alex would practice playing on them. After spending time playing Eddie's drum kit, Alex became more skilled at the drums than Eddie was. When Eddie heard Alex's mastery of The Surfaris drum solo in the song "Wipe Out", he decided to learn to play the electric guitar. Alex was influenced by Budgie drummer Ray Phillips. Alex, Eddie and three other boys formed their first band when they were in the fourth grade, calling themselves The Broken Combs; they performed at lunchtime at Hamilton Elementary School in Pasadena. In 1971, Van Halen graduated from Pasadena High School in California. He then took classes in music theory, scoring, composition and arranging at Pasadena City College for a short while. While attending Pasadena City College, Alex met Michael Anthony and David Lee Roth. They formed the band Mammoth, and Alex, along with the others, left Pasadena City College. Alex Van Halen had several early bands with Eddie before the formation of Van Halen. Names of these previous bands include The Broken Combs, The Space Brothers, The Trojan Rubber Company, and Mammoth. In 1972, Alex and Eddie Van Halen formed Mammoth with Mark Stone on bass and Eddie on lead vocals. The band rented David Lee Roth's PA system for their shows. Soon after, Edward became tired of singing lead vocals, and asked Roth to join the band. Later, in 1974, since the name Mammoth was already taken by another band, the name was changed to Van Halen, and Stone was replaced by Michael Anthony. Roth has claimed that it was his idea to rename the band Van Halen, and that he actually named it after Alex. In addition to his musical duties at this time, Alex handled managerial duties, such as booking gigs, etc. for the band. Their 1978 self-titled debut album Van Halen was released to much fanfare, influencing many musicians in hard rock. Although the term "brown sound" is generally associated with Eddie's guitar, it was actually coined by Alex to refer to the sound of his snare drum. The only recording Alex has made outside of Van Halen is the instrumental "Respect the Wind" (for which the Van Halen brothers were nominated for a Grammy Award in 1997 for Best Rock Instrumental Performance), featuring Alex on keyboards with Eddie on guitar. The song was written for the 1996 film Twister and plays during the end credits of the movie. Van Halen's main influences include Billy Cobham, Ginger Baker, Keith Moon and John Bonham, and he has cited jazz drummer Buddy Rich's work as having an early and lifelong impact. Van Halen married Valeri Kendall in June 1983, after a two-year engagement. The marriage ended in divorce two months later. Van Halen's first of two sons, Aric Van Halen, was born October 6, 1989; Aric's mother was Van Halen's ex-wife, Kelly Carter, whom he divorced in August 1996 after 13 years of marriage. Van Halen married his current wife, Stine Schyberg, in 2000. She is the mother of his son Malcolm Van Halen. Van Halen is the uncle of Wolfgang Van Halen. After the death of his father Jan in December 1986, Van Halen embraced sobriety in April 1987. Van Halen has become an ordained minister and presided at the wedding of his brother Eddie in 2009. ^ "New Netherland Institute". Newnetherlandinstitute.org. Retrieved August 10, 2018. ^ "Alexander Arthur (Alex) van Halen". Newnetherlandinstitute.org. Retrieved August 10, 2018. ^ "Happy Birthday, Alex Van Halen!". Vhnd.com. June 17, 2013. Retrieved August 10, 2018. ^ a b c "Alexander Arthur (Alex) van Halen". Newnetherlandinstitute.org. Retrieved February 9, 2016. 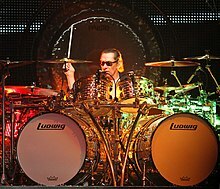 ^ a b c d e "Drummerworld: Alex van Halen". Drummerworld.com. Retrieved December 1, 2008. ^ Christopher, Michael (February 6, 2015). "Rock Music Menu: Eddie Van Halen set for Smithsonian talk". Delaware County Daily Times. Upper Darby Township, PA. Retrieved February 13, 2016. ^ "Alex Van Halen". Drumsoloartist.com. Retrieved January 13, 2008. ^ Wurster, Jon (June 2012). "Alex Van Halen: Of Sound and Vision". Modern Drummer. 36 (6): 52–53. ^ "BLABBERMOUTH.NET - Founding BUDGIE Member RAY PHILLIPS Working On Solo Debut". Roadrunnerrecords.com. Archived from the original on December 6, 2008. Retrieved October 14, 2009. ^ "Rock and Roll Hall of Fame". Rockhall.com. Retrieved January 18, 2008. ^ McCully, Jerry. "The Early Years of Van Halen: A Paper Route, a High School Essay, and a Couple of Lucky Breaks". Archived from the original on March 24, 2011. ^ "Alex Van Halen". ClassicVanHalen.com. Retrieved March 22, 2008. ^ "Grammy Nominations from Rock on the Net". Rockonthenet.com. Retrieved August 10, 2018. ^ "Alex Van Halen: Bashing and Crashing In the Here and Now". Moderndrummer.com. Retrieved July 16, 2014. ^ "Alex Van Halen". IMDb.com. Retrieved August 10, 2018. ^ Kreps, Daniel (June 29, 2009). "Eddie Van Halen, Janie Liszewski Married in California". Rolling Stone. San Francisco: Straight Arrow Publishers, Inc. Retrieved July 6, 2014.